The Frankfurter Algemeine Zeitung reported Thursday the 26th, that the Ukrainian oligarch Ihor Kolomoisky, whom Ukraine’s President Petro Poroshenko recently removed from control over Ukraine’s monopoly oil-transport firm and from being governor of a Ukrainian province, had been using his private army, augmented by forces from Dmitriy Yarosh’s Right Sector party, to rob other oligarchs, especially Ukraine’s richest one, Rinat Akhmetov. Akhmetov’s companies are mainly in eastern Ukraine, and so Akhmetov had been trying to avoid siding with either the post-coup Ukrainian government or the anti-coup residents of the far-eastern, and pro-Russian, Donbass region of Ukraine, who reject it. 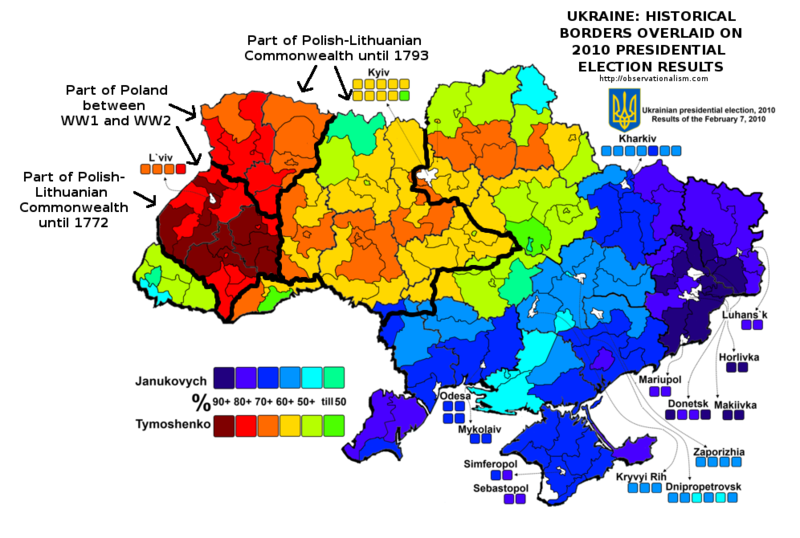 (That’s the dark-purple area shown on this voting map of the last Presidential election before the coup, where 90%+ of the residents had voted for Viktor Yanukovych — the man who was overthrown in the coup.) Akhmetov was thus vulnerable after the coup. This article reports that, “In the center of it all there stood a man named K., a prominent and close associate of Kolomoysky.” Earlier, the article says, “Kolomoysky’s deputy as governor, Hennadij Korban, was preparing to organize demonstrations in his stronghold Dnipropetrovsk,” which is the region to which, after the coup, Kolomoysky had been appointed governor by Oleksandr Turchynov, who had been appointed by Arseniy Yatsenyuk, who had been appointed by Geoffrey Pyatt, at the instruction of Victoria Nuland, who had been appointed by Barack Obama. Kolomoysky, furthermore, himself appointed Joe Biden’s son Hunter Biden to the board of Kolomoysky’s own gas-exploration company. However, apparently, Kolomoysky, who had long been known for taking over companies by raiding them with his private army, has now become too much for Obama to take, and so Ukraine’s President Petro Poroshenko recently removed Kolomoysky from his posts. Back in June, Kolomoysky said publicly that he would not take instruction from President Poroshenko. But now that Obama has turned against Kolomoysky, Kolomoysky no longer has any effective political power-base in Ukraine, despite his billions and his private army and his backing from Yarosh’s Right Sector, which includes an even larger private army, very nazi. (In Ukraine, the nazis, or racist fascists, are haters of Russians, not necessarily also of Jews; Kolomoysky himself is Jewish, yet he’s also a leading Ukrainian nazi.) Yarosh’s Right Sector troops, as well as Kolomoysky’s own mercenaries, have been the most effective of all of Ukraine’s forces at killing the residents of the rebelling region, Donbass. 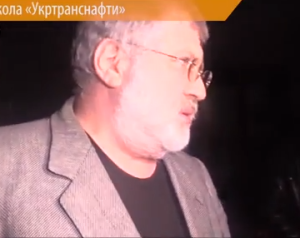 FAZ‘s reporter Schuller says that the Security Bureau of Ukraine (SBU) had found that Kolomoysky was planning to become Ukraine’s “final number one among the oligarchs of the country,” by stealing from Akhmetov and others. Apparently, Obama has decided to let Poroshenko take over. The nazis, whose guns and muscle overthrew the previous president, Viktor Yanukovych, now know that Obama will no longer be beholden to them — he has had enough of them, and he expects everyone to line up now behind President Poroshenko. There has been a contest in Ukraine as to whether the ethnic cleansing of Donbass, to get rid of its residents, would be taken over by the nazi forces or would remain under Poroshenko’s command. Evidently, it will remain under Poroshenko’s command. On March 24th, U.S. Abrams tanks were photographed in Linz Austria on rail cars heading toward Ukraine. If that’s where they are going, then the Ukrainian government might have better weapons this time than they did in either of their previous two invasions of Donbass. U.S. President Obama accuses Russia of arming the residents in Donbass. In his National Security Strategy 2015, he uses the word “aggression” 18 times, 17 of them referring to Russia.